Hoja Santa (pronounced O-hah SAN-tah) is an herb popularly used in the cuisines of central and especially southern Mexico to flavor many savory dishes. The large (up to one foot across), heart-shaped, velvety leaves of the plant have an unusual and quite complex flavor that is hard to describe. The plant is a part of the peppercorn family, and so it has a slight pepper flavor as well as anise, eucalyptus, and nutmeg notes. Hoja Santa contains sassafras-like flavors, too, because it contains the same oils as the sassafras tree. There has been some question as to Hoja Santa's safety, as the oils have been proven to cause cancer in animal studies, but there is no proof of this in humans. This herb is used in a wide variety of stews and sauces across central and southern Mexico. Some of these are yellow mole from Oaxaca, barbacoa preparations and iguana dishes in Chiapas, pipián verde in Puebla, and fish preparations in Veracruz among many others. Though hoja santa is occasionally cut into very fine strips to be used as a condiment in pozole, soups, and egg dishes, is it usually cooked, as the veins are too tough to be eaten raw. The pre-Columbian Mexica people used hoja santa to flavor their bitter chocolate drinks. The herb is still used today in some places to flavor sweet hot chocolate and to prepare a medicinal tea. Fresh hoja santa leaves are sometimes used to wrap and flavor artisanal cheeses and to wrap tamales, meats, and fish for steaming or baking. The dried leaves can also be used as a seasoning, though fresh hoja santa is much more flavorful and preferred for most uses. Hoja Santa is still a bit difficult to find in the United States, although that is slowly changing. You probably won't find it in your local grocery store chain. If you live near a Latin American community, the local markets may have some of this wonderful herb. If not, hoja santa is easy to grow in temperate areas; in fact, it is such a fast-growing and abundant plant that is sometimes considered an invasive weed. If you are unable to find hoja santa at all, you can get a somewhat similar flavoring for soups and stews by using feathery fennel leaves, which also have aromatic licorice-like notes. Hoja santa´s complexity of flavor, however, is not reproducible with any other herb. Hoja Santa means “holy leaf” in Spanish. One popular explanation of this name is a legend concerning the Holy Family: it is said that the Virgin Mary chose the hoja santa, a bushy plant, to hold the Christ Child's freshly-laundered diapers while they were drying. 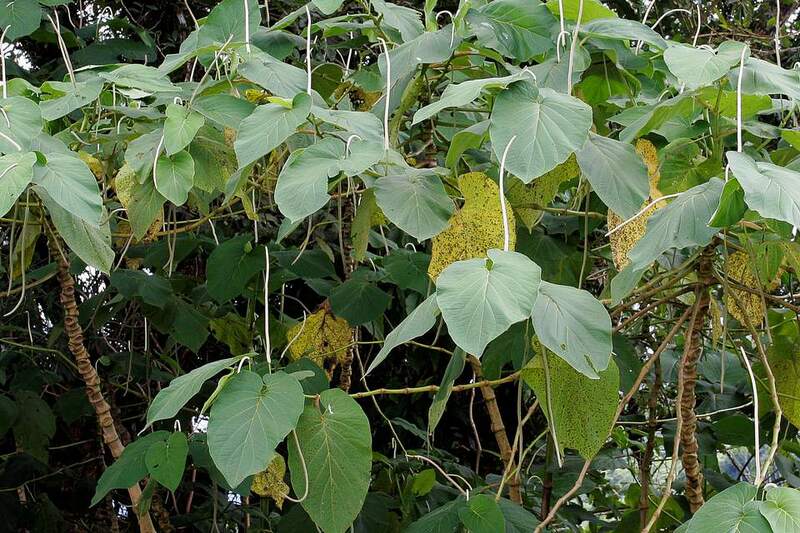 While it makes an enchanting story, it is most certainly untrue as this plant (known botanically as Piper auritum) is native to tropical Meso-America and was unknown in the Middle East 2,000 years ago. In Nahuatl, the language spoken by the Aztecs and still very much in use among certain indigenous peoples in Mexico, hoja santa is known as tlanepa or tlanepaquelite which means “aromatic herbal medicine” and speaks to its use in traditional medicine to treat any number of conditions as diverse as a cough, rheumatism, and female complaints. This wonderful plant has many other names aside from hoja santa or tlanepa. In different areas it is also called acuyo, yerba santa or hierba santa, anisillo, momo, alaján, Mexican pepperleaf, root beer plant, Vera Cruz pepper, or sacred pepper, among others.